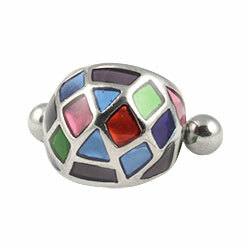 Surgical steel vintage stained glass style ear cuff, 9mm high, on an 8mm bar with 3mm screw-on ball closure. It is a pretty earring but I have yet to fit it. You need 2 people to do it. I love this vintage ear cuff. It fits well and looks brill. I had some difficulties with it in one of my cartilage piercings but I moved it higher and it feels better as it's out the way. I find it a bit fiddly to do up, but it's totally worth it. I'm very pleased with this! really loved this item but unfortunatly it did not fit. Very difficult to get in but was far too tight for my ear, the actual cuff itself needed to be larger to go round my ear and line up with the hole, i hadn't considered this may be an issue so be aware. Lovely size, not too large and a very pretty item. Goes well with the other matching leaf earring! What a lovely ear cuff!! So many compliments because of the different patterns and obviously different from all the other ear cuffs that I have!